Home / I am an educator looking for a partner who has experience in my field, can Mainstream help? Mainstream Technologies has partnered with the most progressive educators to inform and enhance their ability to make data-based decisions. Two relevant examples of our efforts are illustrated in Accreditation and Teacher Licensure. 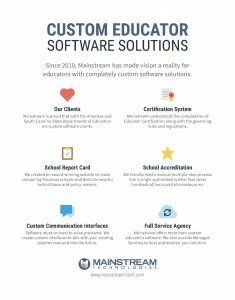 Enabling educators with modernized platforms that improve data collection methods and improve data quality, Mainstream delivers tools that impact outcomes. One example of transformation is the Arkansas Student Information System which was recognized as setting the pace nationally for data quality efforts. To learn more about our education-centric solutions, click here to view a list of articles in our Thought Leadership Library.